The Guggenheim Museum will present the first comprehensive exhibition of the work of On Kawara, the broadest representation to date of his practice since 1963. On Kawara—Silence invites the viewer to consider a body of work that engages the nature and experience of time and place. Installed along the spiral ramps of the museum according to a framework of 12 sections, or “chapters,” devised by the artist, the exhibition features work from 1963 through 2013 and includes every category of On Kawara’s output, much of it produced during his travels across the globe: monochrome Date Paintings (from the Today series); telegrams (the I Am Still Alive series); stamped tourist postcards (the I Got Up series); city maps marked with the route taken by the artist on a given day (the I Went series); lists of names of people encountered that day (the I Met series); newspaper cuttings (the I Read series); a complete inventory of paintings (the Journals); and vast calendars (One Hundred Years and One Million Years). Numerous drawings produced in Paris and New York in 1964, which are fascinating proposals for unrealized works, and Kawara’s only two extant paintings of 1965, Location and Title, which herald the Today series, offer a historical perspective and indicate the emergence of the pictorial idiom he continued to pursue throughout his career. The exhibition also presents three months of consecutive Today paintings, identified by the artist collectively as Everyday Meditation, part of which was displayed in the 1971 Guggenheim International Exhibition. Born in Kariya, Japan, Kawara achieved early recognition during the 1950s as a young member of the Tokyo avant-garde. The artist left Japan in 1959, moving first to Mexico City and then to Paris before settling in New York City. During that period of relocation, he abandoned his early surrealistic representations of the body. In 1966 his practice acquired the form it would take thereafter—the intermittent yet persistent production of paintings and other works, most of which serve to identify the time and place of the artist’s whereabouts on the day they were made. 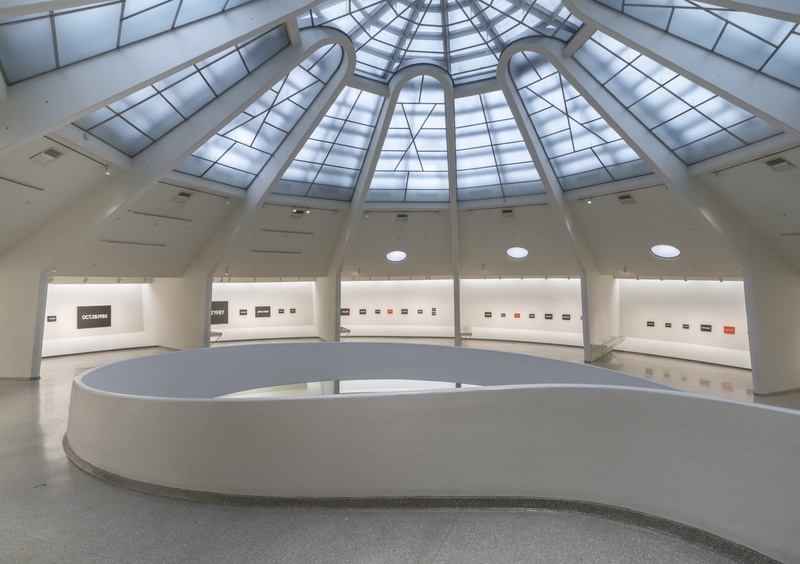 In conjunction with the exhibition, the Guggenheim is organizing a continuous live reading of the artist’s One Million Years, the steady recitation of numbers from a vast ledger, which will be performed on the ground floor of the Guggenheim rotunda. Readings will occur every Sunday, Wednesday, and Friday from February 6 through May 3 from 11 am–5 pm. The public is invited to participate and must register in advance at onemillionyears@guggenheim.org. For more information, please visit the Guggenheim’s website.